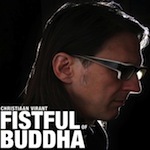 Virant is better known for his works with Buddha Machine and has finally escaped the shackles of that project to venture forth on his own. Opening up with the soundtrack led ‘Title Sequence’ is an immediate insight into what to expect from ‘Fistful…’ before it truly gets going. ‘River Pearl’ is up next utilising clever passages of light ambient with an eastern classical edge. Never overstating itself this is professionally done, walking a fine line of electronica and analogue swaying beautifully into the simplistic tones and drones of ‘Monkey Mind’. The title track itself provides more of the previous output on this release whilst leaning more on the electronics. For me there is something about Virant’s work that owes more than is intentional to the school of John Carpenter composition and this track alone wouldn’t be out of place on the soundtrack to “Escape From New York’. There are some truly glorious episodes on this album as tones effortlessly filter through, as ghostly voices amongst the crackles and pitches of sound; ‘Grey Zone’ being the epitome of this. Meanwhile, a broad plethora of influences make for an intriguing listen right through to the end credits of ‘Yuan Yi’, bringing together an overall gentle release that expressively breathes as opposed to shouting its credentials.